Is there “one best way” to govern public services? Catherine Durose discusses her latest article with co-authors Jonathan Justice and Chris Skelcher. Catherine is on the Editorial Board of Policy & Politics and is based at the University of Birmingham, UK. What is the best way to organize the design and implementation of public policies and services? We do not pretend to know. Further, we would argue that a meaningful answer can be provided only contingently. It might therefore be more productive to ask a slightly different question: How can we go about figuring out – in a given situation at a specific time with respect to a specific complex of decisions and services – what the best way might be? A century ago, industrial engineer Frederick Taylor famously argued that managers ought to determine the one best way to do any given task, and then train their subordinates to do things in precisely that best way. Contemporary scholars of organization, however, tend to agree that activities for which a single best way can be prescribed and implemented are very rare. In the 1950s, scholars in the rapidly suburbanizing U.S. debated whether local -government policies and services were better organized through a multiplicity of jurisdictions or through unitary consolidated metropolitan governments. Versions of that debate continue to this day, not only in the U.S. and focused on the governance of metropolitan areas, but also more broadly in terms of questions about subnational, national, and trans-national governance and service delivery. Centralization or decentralization? Public agencies or private vendors? Unitary or federal constitutions? Representative or direct democracy? Finer or Friedrich? As is often true of discussions with political and distributional implications, these debates tend to involve a mix of ideological and analytical evidence and conclusions. Partisans of radically opposed viewpoints however, do often seem to agree with Frederick Taylor that there is going to be one best way to organize and perform public governance and services. Sometimes the arguments are offered even more broadly than Taylor’s: Taylor was always careful to use empirical analysis to understand the task-specific nature of his search for the best way. Similarly, Vincent Ostrom, Charles Tiebout, and Robert Warren pointed out in a 1961 article that the best way of organizing public-service decisions and supply was also likely to be task-, technology-, and constituency-specific. Elinor Ostrom’s several decades of careful empirical study built upon that insight and her elaborations of it subsequently earned her a Nobel Prize. While Elinor Ostrom’s Nobel-winning work and the original 1961 article are still widely cited a half century on, its proposed “polycentric” mode of design analysis has itself often become a subject of the kind of flatly ideological and dogmatic one-best-way assertions it sought to move beyond. In a recent article in Policy & Politics we have tried to remind our readers that the best available recent as well as historical scholarship still tends to confirm the basic insight: Even in those rare (perhaps chimerical?) instances where all parties can agree upon a single problem definition and needs statement, and upon the one best set of policy goals and service priorities, we (the international community of policy scholars and practitioners) simply do not yet know enough in most cases to state categorically even whether there is a best way to organize and deliver the services at issue, much less what that one best way might be. Are we suggesting that scholars and practitioners should simply throw up our hands and surrender? Of course not. Our point is not that efforts to identify the best way are inherently futile, but rather than they should be undertaken in an awareness of the inherent contingency of the interacting policy values, politics, technologies, times, and places that collectively determine what is going to be “best” for any situation and set of constituencies. Among policy analysts, the evidence-based policy movement represents one effort to focus on measurement rather than ideology. 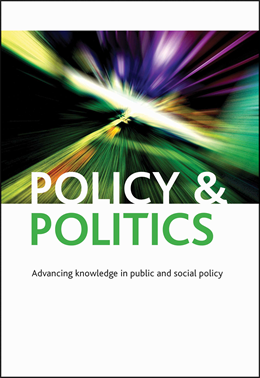 The complementary movement to incorporate values and experiences explicitly into policy analysis offers some hope that the covert ideological biases built into some conventional methods of measurement and analysis can be exposed and accounted for. For designers of institutional and organizational arrangements, we think the original basic polycentric insight and analytic framework still offer a useful template for how to proceed. Recognizing that in a viable democracy, public values are rarely if ever uniform and that our aggregate scientific understanding of policy and organizational causes, effects, inputs, and outputs is still developing and far from complete, we argue for recognizing values and conflicts over values, technological contingencies, and limitations on our ability to comprehend their complexity. Readers of this blog might shrug dismissively at the obviousness of this assertion, but a glance at the popular press and professional literature suggests that what is obvious to experts often seems not to be acknowledged by the understandings and prescriptions that dominate the thinking of decision makers or the world of actual service design and delivery. Our article and the literature it reviews take notice of the ways in which technical, political, and normative factors, and the details of service design and implementation all interact to determine the actual results of public-service decision making and delivery models. Given the continuing development of various forms of decentralization and delegation by central governments within their own territories as well transnational institutions, a polycentric perspective frames the analytic problem as an empirical one. How do actual arrangements, and how might proposed arrangements, actually shape not just democratic legitimacy and accountability but also the quality and equity of governance, active direct participation by diverse individuals and communities, and their power to determine their own futures?